The granddaughter of pulp author Paul S. Powers, Laurie was introduced to the pulp community in 2007 through the publication of PULP WRITER: TWENTY YEARS IN THE AMERICAN GRUB STREET, an autobiography and appreciation of her grandfather. She has also edited several collections of her grandfather’s work in various genres, releasing a number of previously unpublished stories. In 2013, she helped to arrange the donation of her grandfather’s personal papers as well more than 400 pulp magazines featuring his work to the Rare Books and Manuscripts Library at Ohio State University in Columbus. Laurie also publishes Laurie’s Wild West, an Internet blog site that has become a favorite destination for those interested in the pulps. Powers was selected by a vote of all living winners of PulpFest’s Lamont, Munsey, and Rusty Awards. The Munsey Award is a fine art print created by Dan Zimmer of a David Saunders painting. 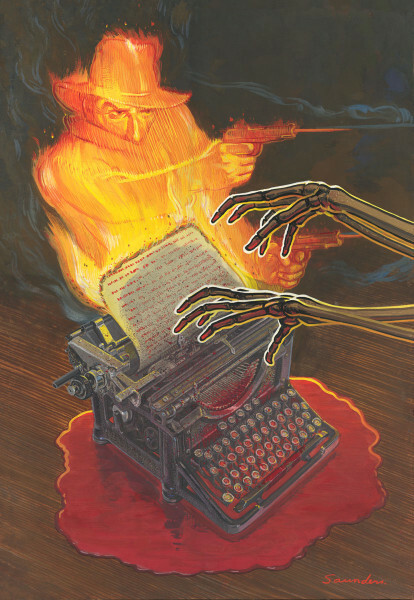 This entry was posted in Awards and tagged Munsey Award, Pulpfest by Mike Glyer. Bookmark the permalink.